1-Eliminate Stress, body pain and emotional suffering. 2-Erase all levels of guilt. 3-Transform all concepts of lack and personal impotence at speeds that will amaze anyone while adding. <vital energy>, <creative productivity>, <satisfaction>, and <greatly enhanced personal power>. You can create wellness and stay healthy with the Body's Secret Code-the newly rediscovered Rosetta Stone of creating illness and wellness. You can serve as a healing companion to your entire family and all your friends in all areas of their life, even at a distance. Help your children maintain better health by a different manner of observation. Drop that deeply ingrained victim attitude and magically and instantly enter a new reality, a new paradigm with the creative physics of abundance. You can discover and use your 10 inner senses. You can discover and use the Nutrients of the Soul. Overcome your spiritual deafness and spiritual miserliness-your "deaf-perception and your missed-giving". Discover exactly how life speaks to you individually with The Inner Creative Language. Learn how you create reality in 3-dimensional metaphors. "Awaken your sleeping genius" and, connect with your Life Purpose Vibration for inspiration. Truly live an inspired life, now. You can finally find real meaning in your life. An ideal tool for everyone who would like to experience and re-discover the creative magic of true instant healing, including parents, professionals, physicians, healers, and therapists of all schools. Heal Your Life At the "Speed of Sight"
Eric Rolf is the creative explorer and developer during the past 35 years of the Alma Creative Living Paradigm and the Be There, Now paradigm or IPM, which include all the Soul Medicine knowledge and methods (both ancient and modern) as well as a number of other creative contexts for vital, abundant living not directly health related. Eric Rolf is a modern "Renaissance man" born in New York City on November 27, 1936 Since early childhood he began his life adventure as a creativity and communications explorer, wanting to know in depth how both work; he felt equally drawn to both the arts and humanities as well as to the creative, more advanced side of the sciences like chemistry, psychology and quantum physics. Albert Einstein, Niels Bohr and Leonardo DaVince along with Carl Jung were his early heroes. At Ohio University he studied journalism and delved deeply into motivational psychology and a wide range of philosophical viewpoints. After working for a number of communications organizations, in 1963 at age 27 he joined Exxon Mobil in Aruba , Netherlands , Antilles as head of communications. Since then he has lived and worked mostly in various international locations throughout Latin America, the Caribbean, the Pacific and Europe, where he has lived and worked for the past 25 years, mostly in Spain and Sweden. It was in Venezuela that a number of dramatic inner awakening experiences occurred and in 1970 at age 33 he struck out on his own to continue his personal exploration. It was about this time that he first became aware of how life speaks to us in metaphor through the various organs and illnesses and how we participate in the creation of those conditions. About this time he also re-discovered a number of ancient secrets that have been called today's Rosette Stone of healing one's life. Einstein once described his life's work as "trying to find out how God thinks." Rolf has said he was always more interested in what God does, "how the mystery moves, creates and expresses. "It is clear that we are immersed in an ocean of constant conscious creativeness. The divine principle is comparable to an unimaginably talented and powerful artist and that also is our own essential nature. "Life's guiding principle is directly involved with creative movement, with action, change, expansion, newness. We are a part of all that is and when we align our own creative consciousness correctly with more elevated possibilities, the results are astounding and neither the scientific nor the mystical vocabulary is capable of describing the results or existence fully. The ancients (pre-Mayan and pre Atlantean) knew and applied these secrets to build pyramids, healing temples, large, prosperous civilizations and even flying machines. They learned it directly from life and applied it directly in their own life. "Life itself is the magic and the miracle. It is a direct experience, to be lived and tasted, not to be defined or explained. It is not a problem to solve, but a mystery to explore. At best, knowledge inspires us to the next step in this never ending journey or creative adventure of trying to discover and realize more of what we already are and to share the fruits of where we have passed. Be that enormously powerful, loving and creative being you know you can be and which you already are. Be There, Now!" The Be There, Now paradigm. Of Inner Perceptive Movement (IPM). The Quantum Leap release method. He is the author of various books and numerous articles including Soul Medicine THE HEART OF HEALING. Counting on your Soul, The numerology of the Soul; Imagination and Numbers for Inspired Living, Einstein's count on your fingers guide; Fruits from my tree, and he also publishes material in his own Ezine. Rolf has been sought out by a number of celebrated artists and multi national companies. He has been called on by John Lennon, Yoko Ono, Paul Simon, Peggy Simon, Carlos Santana, and Gilbert Williams among others, including a wide range of Spanish and Swedish artists and celebrities. Among a few of the well known companies for who he has consulted are included: Exxon/Mobil, NASA (Skylab II/'73), Swedish Telephone (Televerket), Ericsson, Philips, Scan-Air, and McCann-Ericsson among others, including a lengthy list of differing advertising/marketing/ media companies and other creativity oriented organizations. Celebrate the ease with which you can create "healing magic" in all your trying life conditions be they physical, emotional, mental or even financial. Understand clearly how the basic premise about illness has been greatly mistaken and severely limited-which has caused you pain, expense and frustration. See for yourself how physical conditions considered chronic or even incurable by conventional methods can change rapidly or disappear completely. Realize convincingly with valid proof in your own life that what we have been calling an illness, as well as other types of uncomfortable situations, is actually a communications from life or the deepest part of our your self which you haven't acted on. The Chinese have said for centuries that an accurate definition for insanity is someone who continues doing the same thing and expecting a different result. That is obviously an accurate statement. Yet, it is not that we don't take action, only we do not take a new action. For the majority, a new action is not really new, only new in appearance. It is not the mysterious future but the past fixed or made better. It is the idea of newness and change, a very high vibration when you get into it, which triggers all those self critical beliefs, doubts, fears and resistances. We believe we can't or don't know how and thus the risk seems bigger than it is. However, there is a part of you that knows you can and knows exactly how and you can easily access that knowledge and almost effortlessly take a new action. The Chinese also said that the 1,000 mile journey begins with a single step. 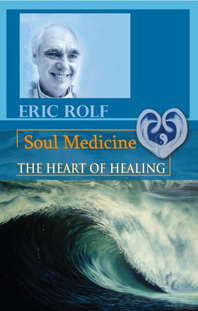 In soul medicine Eric Rolf says "there is only one step. You can be there, now." Discover and experience that when you do take the appropriate action in your life the condition changes rapidly; sometimes so quickly as to appear magical or even miraculous. Imagine the value of a system whereby you can understand, and more importantly take action, on what your inner knowledge is indicating. The Alma Paradigm can be considered the medicine of soul. Yet the only illness that Soul Medicine recognizes is a kind of high energy or "spiritual deafness" and a "spiritual miserliness." We are 99 per cent non material or spiritual and only 1 percent material. Of that 1 per cent 80 per cent is water, both in our bodies and on the planet. We are like the iceberg that has much more invisible than visible, yet the unseen determines much if not the majority of our life situations. Soul Medicine simply recognizes this fact. This is a major leap forward in its own right. Yet it doesn't stop there. It provides a secret body code relating each organ both inner and outer with specific areas of your life-when your kidneys are bothering you, its root cause is in your relationships with brothers and sisters or very close friends or partners. Your knees are related to parents and authority figures and power; your liver to your beliefs and philosophy of life. Just about every organ, both inner and outer is covered. It also relates some 50 common ailments for the additional information they provide. And that's not all. What is probably the most valuable part of the Soul Medicine paradigm is what is called The Inner Creative Language. This is the world's first schematic exploration of how intuition actually works, how life speaks to each one of us individually and how to understand and act on this information. It also explores our 10 inner senses--these are in addition to our 5 outer senses of sight, touch, hearing, smell and taste. Now you can benefit from and apply all of your inner talents and possibilities in your everyday life and even do it effortlessly, with none of that old resistance to trying something new. Presently you are using less than 3% of your mental and creative ability in a conscious fashion. Imagine what your life might be like if you only doubled or tripled that. Soul Medicine shows you how to live and align your life so that it flows smoothly toward your chosen port of call. Let life's winds energize your movements. You are on a water planet not to walk and stumble but to navigate, to set your sail properly and enjoy the cruise. You will also know how to listen, understand and take appropriate action when either the wind or weather changes. Soul Medicine is your invitation and complete navigation chart for health, personal well being and abundance. A medical doctor and therapist: Since I discovered Soul Medicine, I consider it fundamental in treating my patients. I can personally give testimony in my own life of three seemingly miraculous instant healings, including one in which I was already walking on crutches and hip surgery seemed the only alternative. I consulted with Eric Rolf and haven't been bothered since. I walk and function perfectly. My patients love the method and are astounded with the results. A.G., Seville, Spain. A Dutch Dentist: For many years I was extremely allergic to all types of shell fish. Shrimp, lobster, crab, etc would result in even going to the emergency clinic. With a brief Soul Medicine session of less than 20 minutes while seated with Eric in a restaurant on a beach in Brazil where we had just met, my allergy disappeared instantly and completely and forever. We celebrated it immediately eating a delicious lobster without the most minimal negative reaction. Some months later I visited him at a course in Barcelona and afterward we enjoyed a shell fish Paella. Now I share the Soul Medicine information with all my dental patients for faster healing and lasting dental health. D. P., Lake Como, Italy . Head of Graduate University Training for Nurses: For two years I had severe pain in my right knee and nothing seemed to help beside pain killers. In a one day course which Eric Rolf conducted for our graduate school nurses, he used me as an example to demonstrate the Soul Medicine method. He explored and found the instant causal event which had occurred many years before, allowed me to view it from another point of perception and in a few minutes it was gone. Eric knew it and said now move your leg. There was a loud cracking sound that was heard in the entire hall, but no pain. I then got up and walked around and everything was fine and still is. We now teach Soul Medicine as part of our graduate training. RR, Barcelona. "Origina Causal Instants Can be Unblocked by Instant Insight Resulting in Instant Healing"
You can heal your life at the "speed of sight"
Illness occurs at "the speed of fright' Healing at "the speed of sight'"
"Energy reversals" are self-created (either more or less consciously) or self-attracted energy blocks which impact on our entire nervous system and ultimately produce addiction. These blocks are generally caused by some kind of pain, guilt or a sense of lack, any of which can seem to endanger our survival at some level be it physical, mental or emotional. I call this the unholy trinity of suffering-pain, guilt and lack-and 97% of the world's population suffers from this addiction to a greater or lesser degree. "These addictions show up constantly in our daily life as specific limitations, resistances, frustrations, prohibitions, taboos, physical and emotional pain, guilt, recrimination, remorse, depressions, stress, chronic complaining, low self esteem, lack of confidence, feeling like a victim, financial indebtedness, general dissatisfaction and unhappiness, feeling unlucky, feeling like a failure, profound anger, ire and rage, along with the rest of the spectrum of negative feelings and beliefs about the world and about ourselves, who we are and what our place is or isn't in the scheme of things." PS Here are some additional testimonials. Yoga teacher and dancer: Since many years every time I ate vegetables, which I like, my stomach would hurt and I would feel quite ill. With one Soul Medicine session this has disappeared completely. Not only has my stomach healed but above all some viewpoints I had that were seriously affecting my emotional life. This is priceless, thank you, Eric. Andrea, Stuttgart. Writer of children's stories: Soul medicine helped me understand, accept and love my father and thanks to this I was able to be with him, give him loving support, on his journey to that other reality some call death. Z.F., Seville. Electrical energy sales representative: I am grateful to Soul Medicine for being able to drop my constant judgment and criticism and create a space for acceptance of myself and others. I was also able to drop constantly reliving the past and feel a genuine interest in the mysterious future and how to participate more. M.D., Barcelona. Opera Singer (soprano): In July, 1999 I did my first Soul Medicine course with Eric Rolf. I couldn't imagine then how my life was going to be revolutionized. Yes, without a doubt my meeting with Eric changed my life for the better and, the best part is, it is still happening, the creative adventure continues. E.R., Belianes, Spain. Painter and Neo-Muralist: In October, 1999 I had my first contact with Eric and with Soul Medicine. Since that moment my life turned 180º and began filling with light. Here are a few of my physical changes. -My knees no longer hurt. -I feel young, with lots of energy. -I feel more agile and lighter. -My sexual potency has improved. -My nerves have calmed down. -My finances have improved considerably. -In my emotional body the changes have been spectacular. -I am enchanted with life. -Now I feel truly optimistic. -I am filled with joy. -I have found my place in life. -I feel happy with my work and satisfied discovering that this is my life choice for my self expression. Jm.A, Belianes, Spain. "It turns out that the best healing system of our times is actually an anti-medicine and that we have been mistaken by calling a communication a "sickness" regardless of how loud it was shouting." Factor 99% Ezine. "Finally I am able to understand what all of me wants and am able to act freely on what I know is best for me and my loved ones." EM-sales executive. "The section on the nutrients of the soul should be expanded into an entire book. It changed my life." BU-accountant. "Listening and understanding my personal inner creative language immediately ended my chronic depressions, procrastination and generally low level, unhealthy lifestyle. I am now productive, dynamic and thoroughly enjoy my own company. I discovered I like people and I like to contribute to their lives. You know what? It works, it's great, and it's the best treasure I have ever found. Thanks Eric." TF-design engineer. "There are only two kinds of illnesses and you probably have both: Deaf-Perception and Missed-Giving. These might be compared to a kind of high energy or spiritual deafness and miserliness. All of our recognized symptoms, ailments or other uncomfortable conditions, be they physical, mental, emotional or even financial, ultimately spring from these two perceptive root points." Is the basic premise regarding illness incorrect or at least highly limited? Europe 's best kept secret : the most efficient healing system of our time is actually an "anti-medicine". Learn to heal yourself by overcoming your "spiritual deafness and miserliness"
Learn your body's secret code for rapid healing. Discover how personal intuition actually works and how you can apply your inner knowledge in creating wellbeing. Let words like "magical and instantaneous healing" have authentic meaning in your life and in that of your loved ones. Book facts: ebook, 255 pages, entirely new English version. The original Spanish version "la Medicina del Alma" (now in its 6 th edition) has been a best seller for years in Spain, Scandinavia and throughout Europe and Latin America. A useful guide for changing one's personal paradigm. The possibility of dropping a deeply ingrained victim attitude. A practical guide to begin hearing one's inner voice more clearly. A guide for using your 10 inner senses. Being able to hear life's whispers before it has to scream. Overcome your spiritual deafness. The most efficient self healing model of our time. The rosetta stone of creating illness and wellness. A guide to new experiences in living for the daring. You can create wellness and stay healthy with the Body's Secret Code. You can discover exactly how life speaks to you as an individual. You can discover how reality creates reality in 3-dimensional metaphors. You can alter and expand your perception to discover the magnificence of life's creative process. You can discover that you are an artist, a creator of life and living events in which you also participate. An ideal tool for physicians, healers, and therapìsts of all schools. You can discover through experience that Life is unimaginably well organized and totally present. You can live life's synchronicities on a daily basis. You can serve as a healing companion to your family and friends. Discover how children raise the parents spiritually and that the true parents are the grandparents. Discover and use the nutrients of the soul. Eric Rolf does individual consulting, counselling (mentoring) and conducts seminars, and intensives throughout the world. Much of his consulting activity is conducted via the Internet. For more information send an email to ericrolfsoulmedicine@gmail.com describing your interests and your location.